being little • bristol uk fashion & lifestyle blog. 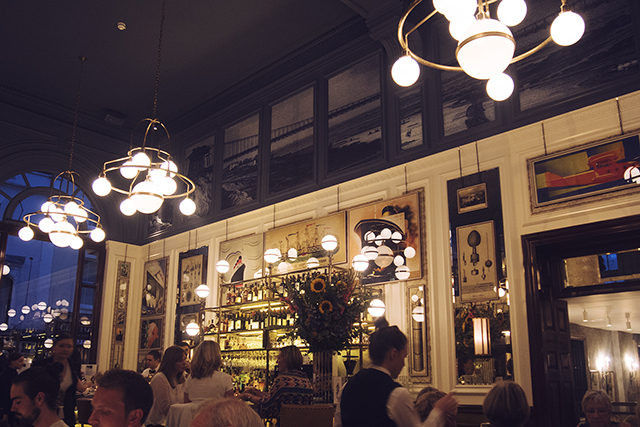 : dinner at the ivy clifton brasserie. 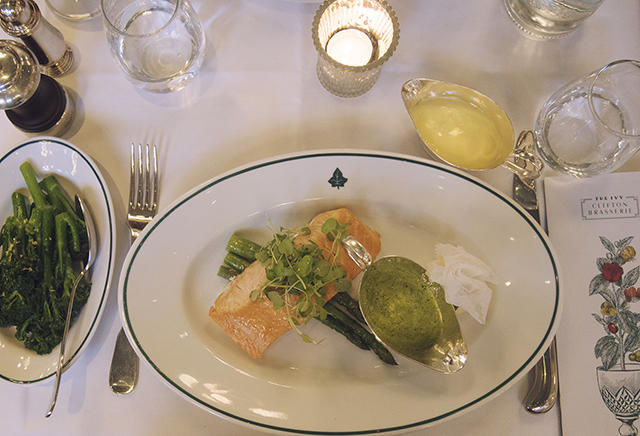 The Ivy is open 7 days a week from breakfast 'til dinner, and has many familiar dishes on the menu - all made to a very high standard. As we walked in through the doors the first things that struck me were the high ceilings and the art deco inspired design. They could do with a little more space around the front desk as a few people came in behind us making it rather cramped, but once they'd figured out where we were sitting they ushered us over to our table with a smile. They definitely get a big tick for friendliness. We started with cocktails (above). 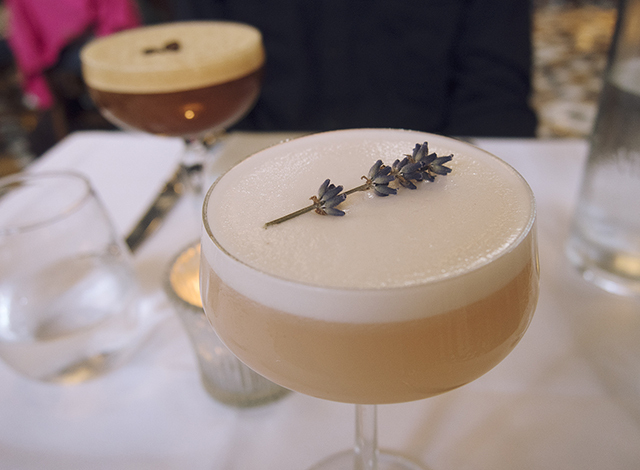 A Lavender Lady for me - a slightly sweet gin cocktail with a very subtle hint of lavender - and an Espresso Martini for him. 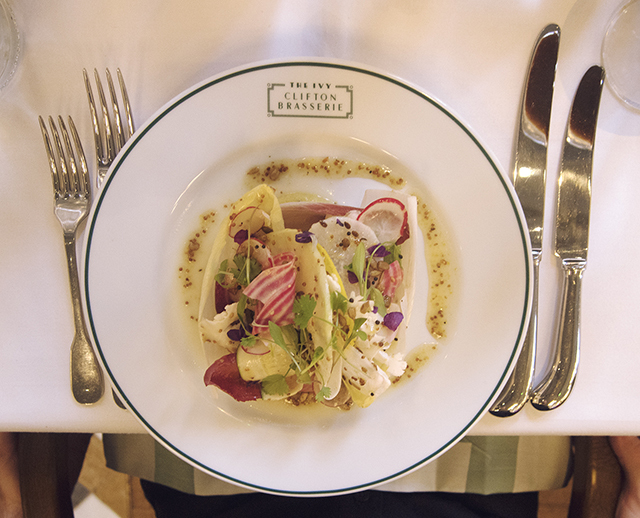 For our starters, Sam chose the Raw Market Salad - which was very pretty, colourful and fresh - and I picked the Seared Scallops. 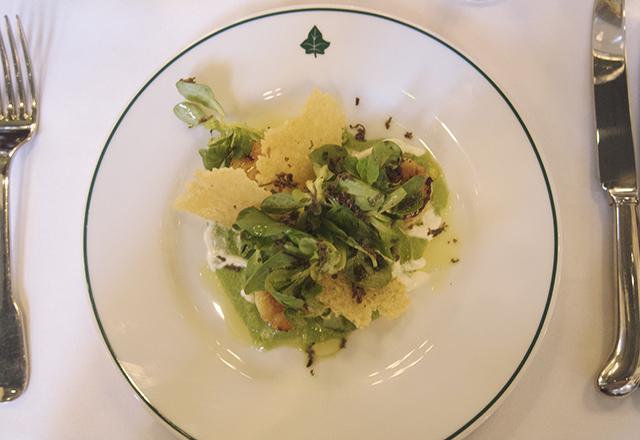 My scallops were cooked perfectly and I loved the flavour combination with the pea puree and parmesan crisps. On a bit of a fishy theme, he had the Salmon & Smoked Haddock Fishcake and I chose the Roast Salmon Fillet, and various extra greens to share. 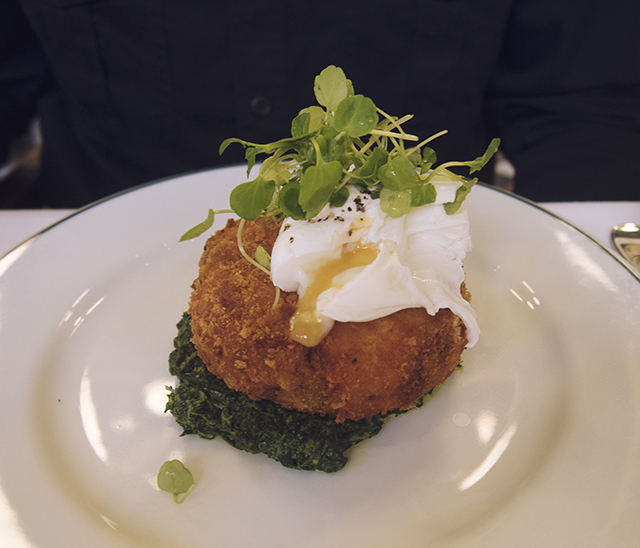 The lovely big fishcake comes with a perfectly poached egg & creamed spinach - so again, Sam chose the prettier meal. My salmon was cooked exactly how I requested, and was really good with the herb sauce and a squeeze of lemon. 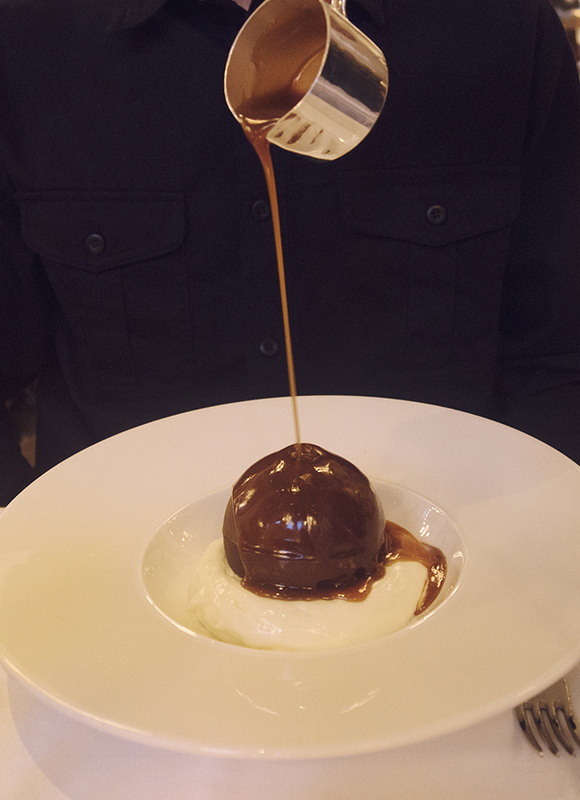 We both fancied something chocolatey for dessert. 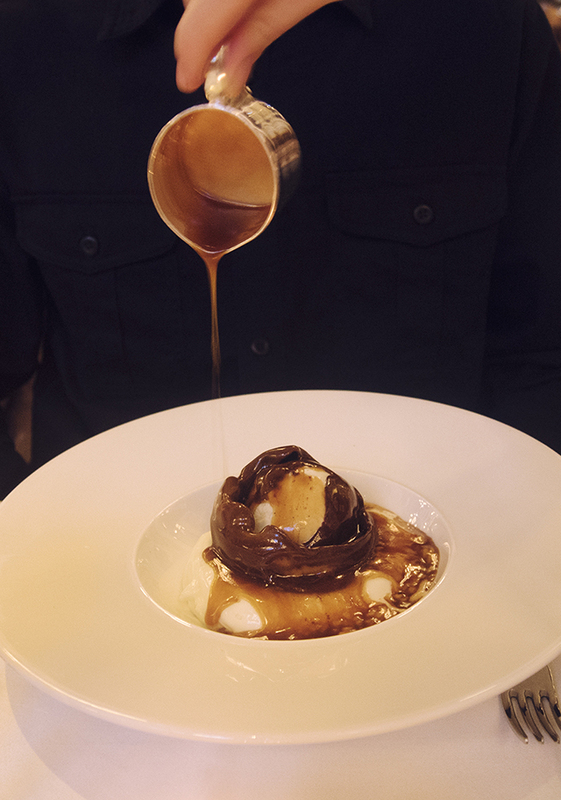 Sam chose the Chocolate Bombe, which the waitress poured hot salted caramel sauce over, making it melt into a pool of yumminess (just like on First Dates!). 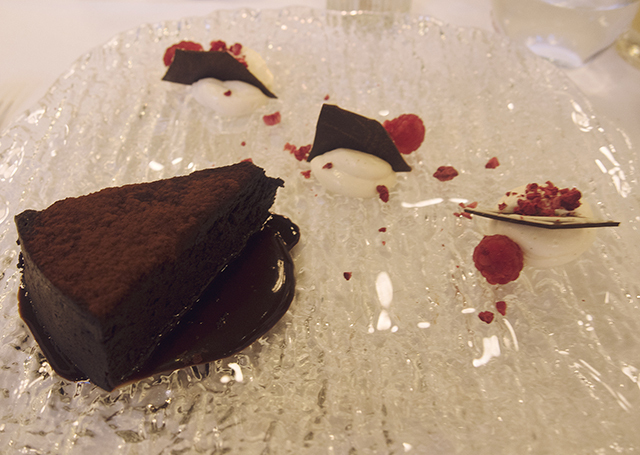 I had the Warm Flourless Chocolate Cake, which was dense, dark and decadent, and served with raspberries - which is one of my favourite combinations. All in all, a lovely little evening full of tasty food. The place itself is beautiful & feels like you're somewhere a little bit special, but the staff were still really down to earth, jokey and helpful. I'll definitely be heading back for another little treat sometime! It looks beautiful! Especially the dessert! Yum! omg looks so yummy! great pictures. And now I'm starving. This is so lovely, and you've photographed that Lavender Lady like a dream!